This Hello Kitty card is my least favorite of the series. I am not sure why but I just don't care for it. I used some velvet paper for the bear and wish i would have had a lighter color but since I was using scrap I used what I had. I do think it looks better in person, and it would have looked better had a lighter color to use. The sentiment is a little lame too! It reads "Happy Birthday to my beary special friend" *okie sighs and rolls eyes on how unimaginative she was with this one*. I did faux stitching on this one instead of machine sewing. I figure I better keep my doodling in practice for other things *okie laughs at the word doodling because it is just a fun little word*. I do like the polka dot ribbon on there and think it might be the only redeeming quality on this card. 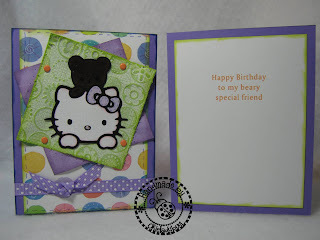 I used the Cuttlebug Spots and Dots embossing folder on the lime green Coredinations Whitewash paper and sanded it. I have said this before but I think it is worth repeating...when sanding an embossed image leave the paper in the folder while sanding. It helps keep from smashing the embossed image and makes it a lot easer to sand. I distressed the edges of the paper for a worn look. On this close up you can see the velvet paper a little better and see how it does add a nice look. I used some hot fix gems on the bears eyes and maybe should have used a different color for those also. If you click the picture you can see more of the detail of the eyes and velvet paper. 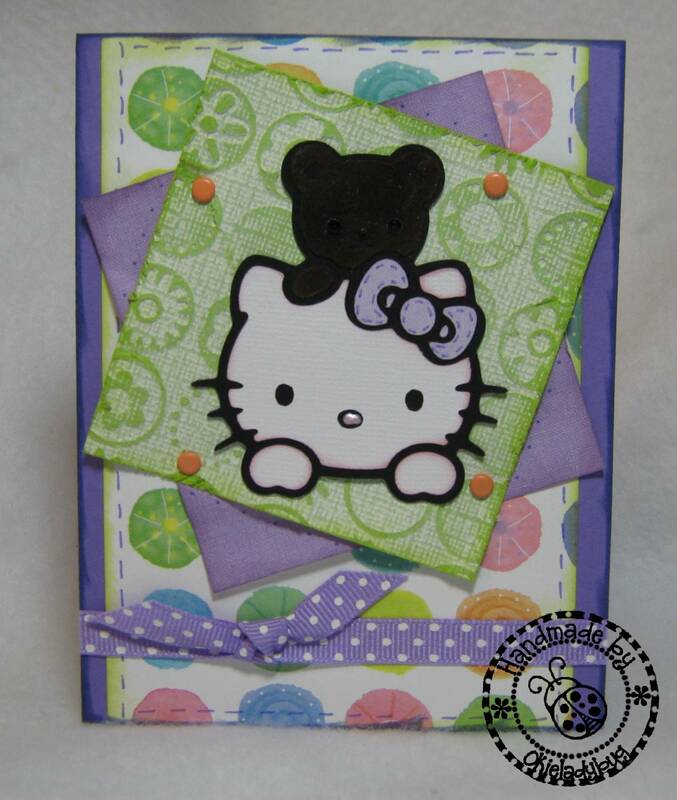 Tomorrow finishes up the Hello Kitty series so be sure to come back and check out the last card and also get the Cut file or Gypsy file for today and tomorrow's cards. Okie, you definately need to give yourself more credit than you do. Your work is always great and I look forward to seeing what you do next. I think it's very cute. Distracted or not girl, you have talent. Don't be hard on yourself. I think it's adorable! Thanks for the tip on sanding. I would never have thought to leave it in the folder. I'm going to give it a try! I think you were still watching the movie when you wrote about this absolutely adorable card. The details are darling. Thanks so much for sharing with us. I think this card is adorable and I love the bear! Love the colors you used too. We never appreciate our own efforts, but the rest of us sure appreciate yours! Keep up the great work. 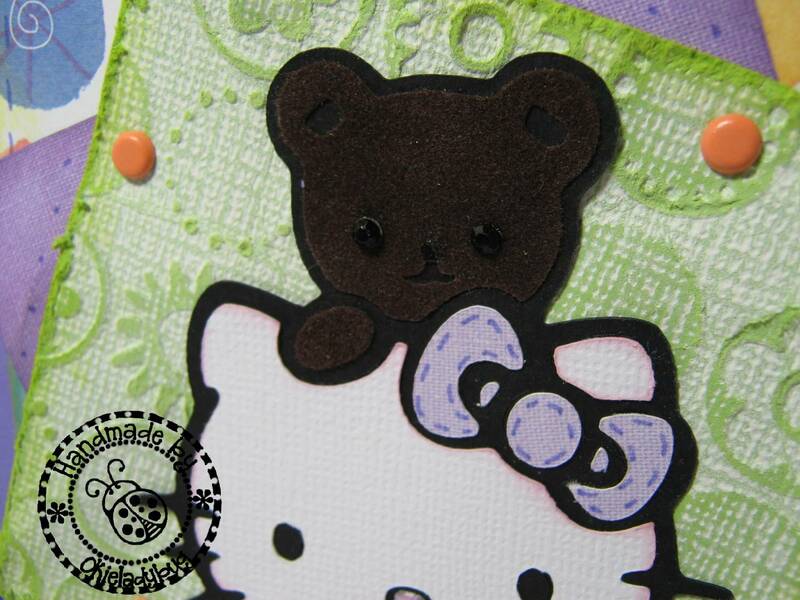 Really cute...great idea to use velvet paper for the bear! Maybe you don't like it because you placed it at a jaunty angle. Your soul longs for straight up and down and subconsciously you want to straighten it up. Crooked is just not your nature, Okie. Oh Okie, I think it's adorable... you couldn't have made it any cuter... I have so loved your series. this is an awesome card!! Thanks for reminding us about the sanding. And thank you for putting different patterns and colors on Hello Kitty besides her traditional pink. It's given me a lot of ideas! See, it IS a great card! TFS. You know what? Before I read your comments, I was thinking how much I loved this card! And the sentiment too! (Does that make me lame?) I'm glad I read though, because on first glance I though the green was just patterned paper. I definitely need to get out my CB and Coredinations CS more - looks great! This is so sweet. I love the bear! Ok now I know I have to give this cartridge a try. The sentiment goes great with the image. You are silly. I love this card ... I bet the teddy does look better in person, some things cameras just can't seem quite get right. But the colors, WOW! Lavender and Green, what a pretty combination. It's another special Hello Kitty Card!!! another great card!!! Your work is ALWAYS beautiful!! Thank you for sharing. Purple & green are my favorite colors, so I really like this. Thanks for the great tip on sanding embossed images too. Don't yell at me :) I know you were probably tired when you wrote about your card, but it just shows I pay attention to you :)! The CB folder is Bloom Dots, not Spots and Dots. Anyway, I love the touch of the CB folder and love love love the color combination. And thanks for the sanding tip - learned something new from you again. Great job as always! you crack me up. as usual you have outdone yourself, movie or not. can't wait to see what you come up with next.